Logitech today revealed two new accessories for the sixth-generation iPad: the Logitech Crayon and Logitech Rugged Combo 2, both designed to help students become "more creative and productive" in the classroom. The accessories were announced during Apple's "Field Trip" event in Chicago earlier today. The Logitech Crayon is a digital pencil, similar to Apple Pencil, but comes in at a cheaper price of $49, roughly half the price of the Apple Pencil (Apple is selling its first-party Pencil to schools for $89). Logitech said that its alternative leverages Apple Pencil technology to deliver sub-pixel precision, low latency, and tilt support. The Crayon works with a wide variety of apps and software already found in classrooms, including Apple's newly updated iWork suite. The physical build of the Crayon allows for easy gripping that also prevents rolling to reduce the potential for accidental drops. The device has an 8-hour battery life, and includes other kid-friendly features like a pry-resistant tip and tethered rubber cap. 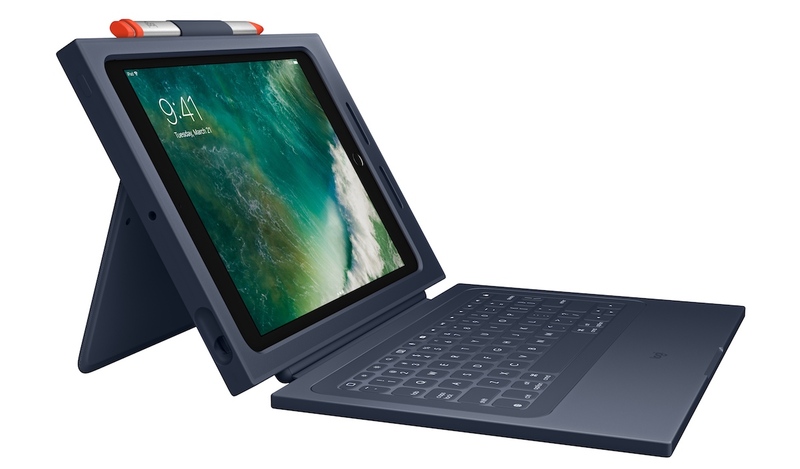 Secondly, Logitech's updated $99.99 Rugged Combo 2 case for the new iPad was announced, created with input from educators so that it can survive "daily wear and tear" in classrooms. The case integrates a protective screen covering that doubles as a keyboard, and also includes a slot for the Logitech Crayon. The keyboard section is detachable and its keycaps are pry-resistant as well as silent while students type on them. Powered by the iPad, the case as a whole is spill-resistant and can protect the iPad from a drop of up to four feet. Logitech launched the first Rugged Combo iPad case one year ago, following Apple's early 2017 9.7-inch iPad update. The keyboard physically connects to the Rugged Combo 2 case using a proprietary connector to deliver a secure keyboard connection, making iPad an approved device for testing. In addition to being durable, the Rugged Combo 2 case offers an adjustable kickstand for a wide range of viewing angles and four use modes: Typing mode, for taking notes; Viewing mode, to watch educational apps and videos; Notebook mode, for writing with digital pencils and reading; and Travel mode, which protects the iPad screen during transport. It also features a pencil holder that’s a perfect fit for Logitech Crayon or Apple Pencil, so students always have the tools they need at hand. Logitech's new accessories will be available for schools to buy in the United States beginning this summer, found on Apple's education website. Is Apple going to open the active digitizer functionality to other hardware makers? 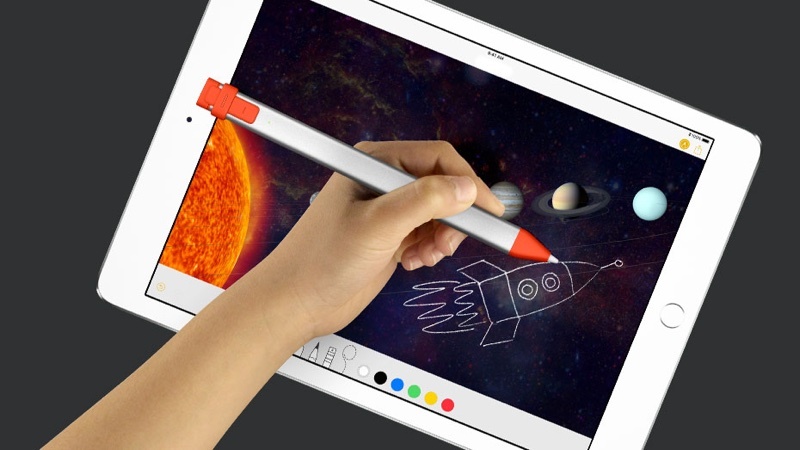 It would be really cool if they did so that other companies could create styluses that actually compete with the Apple Pencil on features or price. Sounds a bit boring this event, overall. I'd consider this if I knew how to integrate this into my four year old daughter's preschool learning/elementary prep without her becoming addicted to it. She uses an old iPad Mini that we have lying around. I bought one of those chunky foam protective cases for it—you know, the kind with a handle that is brightly colored. And I only let her use it 30-60 minutes one day per week, usually on the weekend unless we're traveling far in a car or on a plane. Every single time it's a meltdown when it's time to put the iPad away. I've only got some educational apps/games and drawing/music apps on it as well. She's always really well behaved and doesn't act like this with anything else but the iPad. It's so addicting. Not sure what to do. If she was a lot older I'd just buy her a 13" MacBook Pro which is a lot better for getting work done. I'm not sold about the iPad being the future of education. It sounds like the concern should be the apps that your daughter uses on the iPad, not the iPad itself. If she’s learning, exploring apps with an educational value, then that’s a good thing to be “addicted” to. I have a kid in my family who always has his head buried in a book. Why dissuade that? If you want to get your daughter outside, get AR apps that’ll help her learn about the world around her. If you’re concerned that she’s isolating herself from others, then join her in learning with the iPad. 200gb of free iCloud storage for students that’s not fare grrrr!!!!!! Agree, would be good for artists as well as others. [doublepost=1522167099][/doublepost]Just need to update the iPad Mini now... maybe someday never. And the iPhone too, so that a new Plus sized one could allow note taking, perhaps with a smaller pencil from a third party vendor. So no changes to Apple Pencil. That stinks. Yes. That is why I said this was a step in the right direction. Hopfully Logitech makes their stylus backwards compatible to “older”iPads. They physically couldn't. The active styluses use a plastic nib that doesn't work on normal capacitive screens. I've started playing "old school" games with my son (5) -- Uno, Old Maid, Go Fish, Chutes & Ladders, etc. No screens during the week, and he earns screen time for the weekend. After a couple of days, he was back to his normal self -- waking up and coloring, playing with Hot Wheels, etc. and not raging for a screen.